Skrip - tyur' - i - ent: adj. Possessing the violent desire to write. Got a shoeshine the other day. I agonized for an embarrassingly long time about what kind of shoe to buy (and then for an even longer time on what kind of socks to wear with my new shoes) because I was determined to continue to wear jeans—albeit new, more fashionable jeans—and the shoes had to look decent. 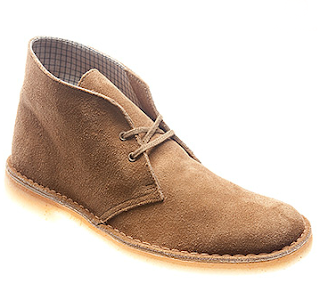 I became enamored with Clarks Desert Boots and ordered a pair online. They’re served me well. But they’re suede. So I can clean them, but not shine them. That said, I have a pair of Doc Martens dress shoes that I like a lot. I’ve had them for years and don’t wear them as an everyday shoe. 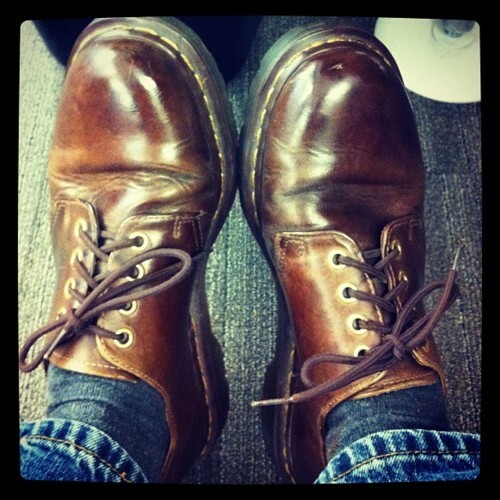 I think of them as my “grown-up” shoes, i.e., what a real professional might wear to work every day. Generally I wear them to fancy functions or for client meetings. I had such a client meeting a couple of weeks ago, so I wore these shoes in. Since there’s a shoeshine guy in the lobby of my building, I figured I’d get a shine. This would be my first professional shoeshine since I had the shoes I wore to my wedding shined. So, it’s been ten years since my last shine. First, a word about the shoeshine guy in the lobby. If you saw this guy in a movie, you’d accuse the writers of lazy storytelling. I mean, he is every stereotypical shoeshine guy you’ve ever seen in the movies: older, African-American, gray-haired, stoop-shouldered, shuffling. He has the typical set-up right outside the elevators, two elevated chairs atop a platform of drawers full of mysterious shoe shining polishes and creams. I walk past this guy every day. Sometimes he’s reading the newspaper, but usually he’s just sitting there staring off into space. I’ve seen very few people stop to get a shine. It strikes me as a sad life… sitting there waiting, waiting for someone to stop. A co-worker and I were talking a while back about shoes shines and what they cost. Thinking back to my pre-wedding shine, I realized that I didn’t remember what it cost. I had it in my head that it was something like $15, but that seems high. But then again, I had nothing to judge it against. What’s it worth to get a shoeshine? It’s not a necessity, it’s more of a commodity. But then again, it’s a status-symbol thing more than anything. So if people will pay hundreds for other status symbols like custom-made suits, why not $15 for a shoeshine? Finally I just stopped and asked the guy one day as I returned from lunch. “Six bucks,” he told me. Okay, that seemed reasonable. So I took my admittedly dull shoes downstairs and hit the guy up for a shine. There were no other customers. I found the entire experience to be a little embarrassing. First, I’m up on this elevated throne, right in front of the elevators where everyone looks automatically as they exit. Then there was the white-guilt aspect of having this little black guy shine my shoes. He asked if I had ever had them shined before, and I admitted that I had shined them myself, but probably badly. He grunted in (I assume) agreement. I brought my newspaper so I wasn’t just staring stupidly ahead, but I mostly just held it up while I peaked at what he was doing. I wondered if there was some secret technique that I didn’t understand to get a really great shine. But he just brushed off the dirt, rubbed off the old polish with some sort of deglazer, applied polish and shined them with a rag. He spritzed the rag with water first, I’ll have to try that next time. He spent a lot of time polishing the toes of my shoes. I suppose that’s the part you can most easily see when you’re looking down. It’s probably good customer relations to make sure that part of the shoe really gleams. It probably took ten minutes. I paid him the six dollars, and tipped him two. I can’t imagine he makes a living doing this. There’s a hotel in my building, and he has to be drawing a salary from them. There’s just no way he’s cutting it by shining maybe a pair or two of shoes a day at six bucks a pop. Like I said, I felt slightly embarrassed by the entire experience. But when I was showing off my shiny new shoes back in the office, I noticed the guy had slopped show polish all over my socks. I’ll have to remember to tell him to be more careful next time, when I get my shoes polished again in 2022. That is amazing. All the shoe shiners in my city (Toronto) seem to be women wearing very low cut tops. It's kind of gross, but I think they do pretty well. That's funny. And smart marketing!